Morning Coffee & Afternoon Tea: Happy Birthday to Meeee! It's here, it's here! My actual bird-day isn't till later this month, but birthday presents arriving early ranks right up there with chocolate, especially when the present is a brandy new Zach & Dani's coffee roaster. A coupla weeks ago, the hubs asked me what I wanted for my barfday. 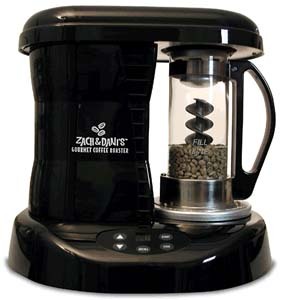 As you may remember, I've been lusting for the Zach & Dani's home roaster kit for a long time now, but unfortunately it turns out the Z&D roaster is "out of stock". What a huge disappointment. However, salvation was right around the corner at Sweet Maria's. Ever since I told him what I wanted I've been waking up SALIVATING at the thought of freshly roasted coffee beans. And it's here, it's sitting on the counter! Hippo Birdies to me! Hairy Birthmark to me! I can't wait to get started. Guess what I'm going to be doing tonight? More pictures will follow! Now, THAT, is a cool looking machine. I will be waiting to read your review. ALRIGHT!! A great gift for a really neat person. Congrats and Happy Birthday!! Awesome! I can't think of a more deserving coffee lover to recieve such a wonderful present. Okay, I looked at sweet maria's....I should read entire sentences, shouldn't I? I checked the site and they are OUT OF STOCK ... wow! Keep us posted how the machine works, and, yes, take lots of pictures.